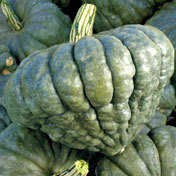 description for "Winter Squash and Pumpkins: Cucurbita maxima, 'Queensland Blue'"
Cucurbita maxima 'Queensland Blue' is a superb winter keeper from "down under" with thick, gray green skin, deep ribbing, and sweet, deep orange flesh. 'Queensland Blue' has a classic buttercup shape is occasionally pointed on the bottom. 10-12 pounds. Planting depth: .5-1 inch. Days to germination: 3-7 days. 105-115 days to maturity. reviews for "Winter Squash and Pumpkins: Cucurbita maxima, 'Queensland Blue'"